Dharmasthala : The preparations are underway as lakh of devotees will take part in Mahamastakabhisheka. Scaffolding work for the anointment event of Lord Bahubali at Dharmasthala is underway, Dharmasthala Dharmadhikari D Veerendra Heggade said. Speaking to the press on Tuesday, Dr. Veerendra Heggade said, the ritual will be held between February 9 to 18 for 39-feet tall Bahubali at Rathnagiri in Dharmasthala. The 13.7 metre width, 62 feet tall with six floor scaffolding is being built using 80 tonne steel. About 400 to 500 people can stand in the scaffolding at a time for abhisheka. Two separate lifts have been arranged to carry people and goods from the back of the scaffolding. Mahapadmaprasad and Mahaveera are constructing scaffolding, he said. As many as 100 saints, Jain Munis and Mathajis will take part in the Mahamastakabhisheka, total 108 Vardhamana Sagarji Muni, 108 Pushpadanta Sagara Muni, Aryika Mathaji under the guidance of Shravanabelagola Charukeerthi Bhattaraka Swami. Around 50,000 devotees are likely to take part daily. The number of devotees may touch one lakh during weekends. The preparations are in underway for the Mahamastakabhisheka. Former Prime Minister H D Deve Gowda will inaugurate saints’ convention on February 8 at 3 pm. In the janakalyana programme, Pejawar seer Vishwesha Theertha Swami and Chief Minister H D Kumaraswamy will take part on February 9. “Bharatheshwara Digvijaya, an attractive procession, will be held on February 13 at 3 pm. A laser show highlighting the history of Bahubali will be held for 15 days. 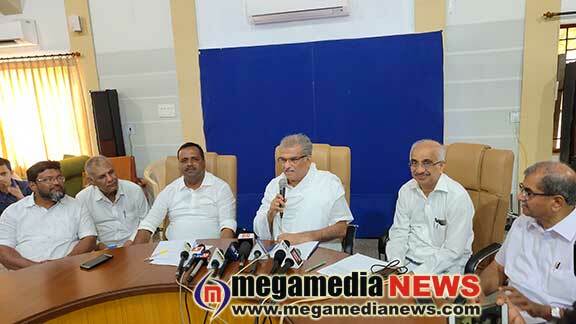 Devotees will be allowed to leave for Bahubali Betta even in the night,” said Heggade. The PWD is taking up development works worth Rs 23.50 crore in Dharmasthala. Also, Rs 15 crore will be spent on four laning two-kilometre road from Nethravathi Snanaghatta to Dharmasthala Main entrance. Funds of Rs 7.5 crore will be spent on converting 4-km stretch from Gangothri building to Snanaghatta to seven metre road. Further, KSRTC bus depot road will also be widened. The road leading to Rathnagiri will be developed at a cost of Rs 1 crore. District in Charge Minister U T Khader said that Rs 2 crore will be sanctioned for taking up beautification work by the tourism department. Additional 50 KSRTC buses will be deployed from different parts of the state to Dharmasthala during Mahamastakabhisheka, Hegde Said.